I used a mix of Suave and Flourish, two of the brand new collections from Authentique. My local store, Scrapbook Daisies ordered all of Authentique's new collections so I'm one step ahead and already have a sample layout made before these yummy papers even arrive at the store! I did some machine stitching around the outside border and even stitched on a sweet little row of sequins. You know I gotta add a bit of sparkle on there somewhere! She got the most beautiful eyes ! Your layout make them pop ! Cute page. She does look like a deer in the headlights...lol! Such a cute pic, and I love the added sequins!! A Big congrats on your new DT spot! Good for you! You're going to be amazing for them! What an adorable photo. I love the honeycomb in the background. Such a wonderful page. Such a cute layout and congrats ont the Chic Tags DT!!! Very pretty layout! Love your daughter's face! So very pretty! Love your layout. and the picture is just adorable. Love the stitching over the sequins and that priceless expression on your daughters face! 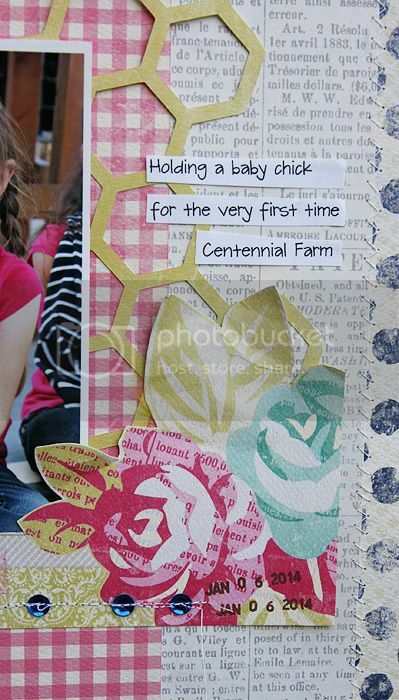 Love this cute layout Mary Ann! The Authentique collection goes perfectly with your photo!! Such a great page! I love the colors and the use of that background! cute page! she's so precious!